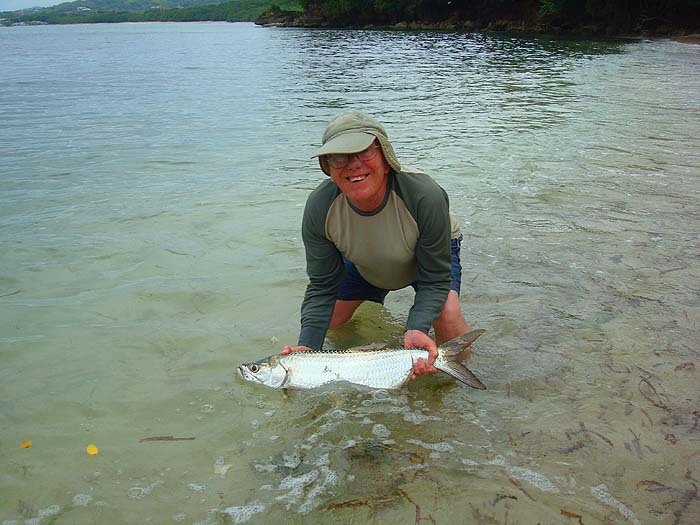 My second week in Tobago was largely spent fishing for tarpon. 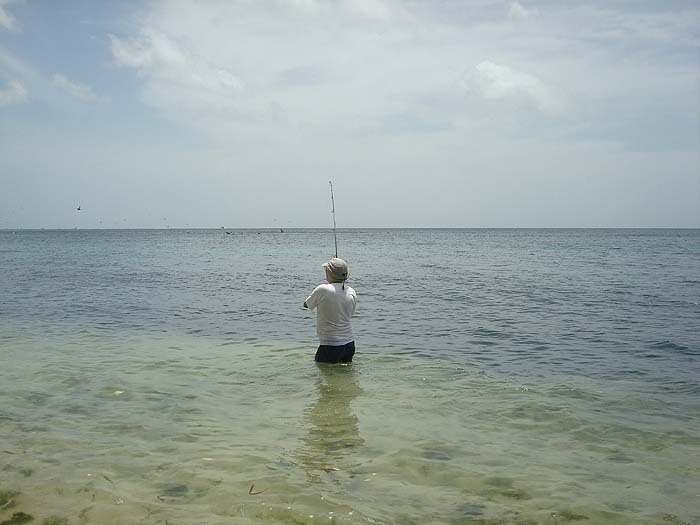 I'd actually intended trying to catch bonefish and barracuda so I started off spinning on the flats with a small, shallow diving, Maria Chase plug. 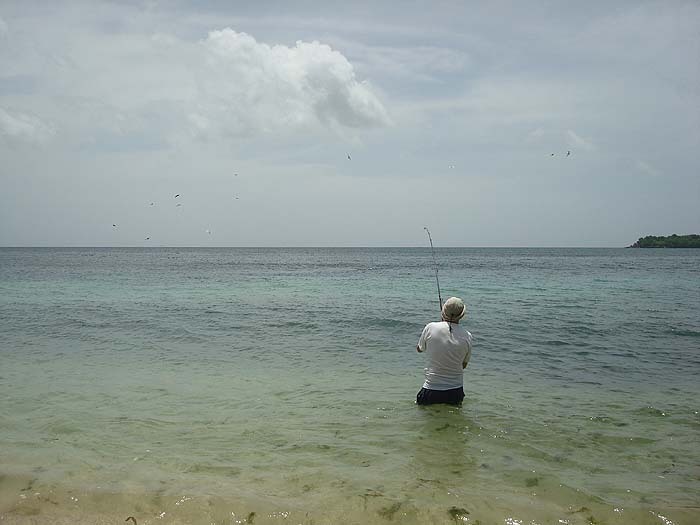 However, on my first attempt the bonefish were not cooperative and apart from one or two small but beautiful snappers I failed to catch anything. Of course I was keeping my eyes open for any signs of fish and it would have been difficult not to see the feeding birds - there were hundreds of them. 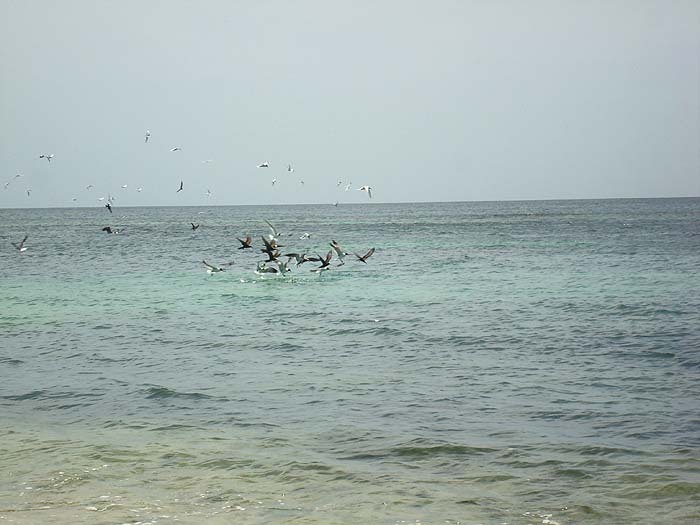 At first it was pelicans with their accompaniment of laughing gulls and every now and again, as I watched, a great sickle shaped fin would scythe through the water or a broad silver flank would flash in the sunlight - tarpon. 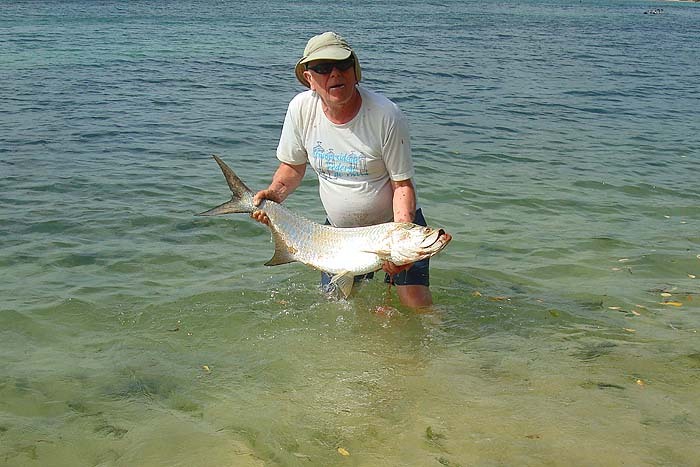 Past experience has shown that tarpon are not always the easiest fish to hook and I was still hopeful of tempting a bonefish so I flogged away with my spinning rod and the little plug on a fifteen pound wire trace. Serious mistake! 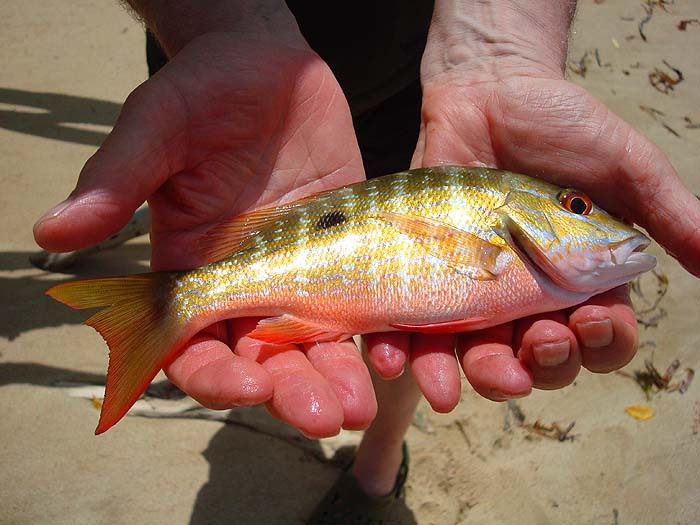 It wasn't long before I had a bite which began to strip line from the reel against a tight clutch. 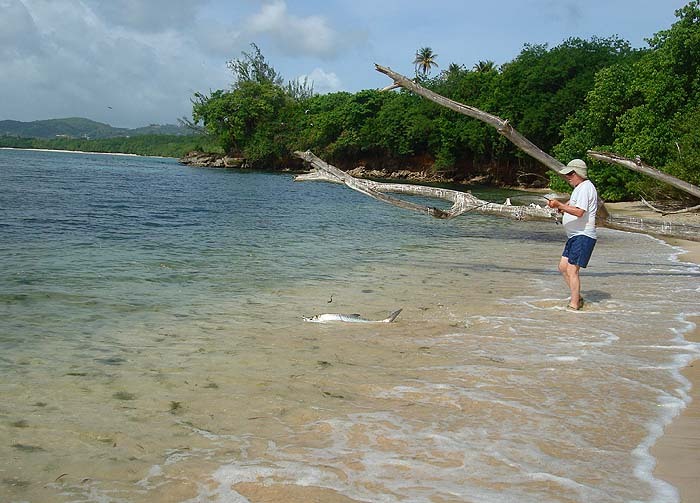 My thoughts of 'bonefish' soon evaporated when the fish launched itself into the air - and showed itself to be a tarpon roughly the size of me. I shouted for my long suffering wife and she came with the camera ready to film the action. 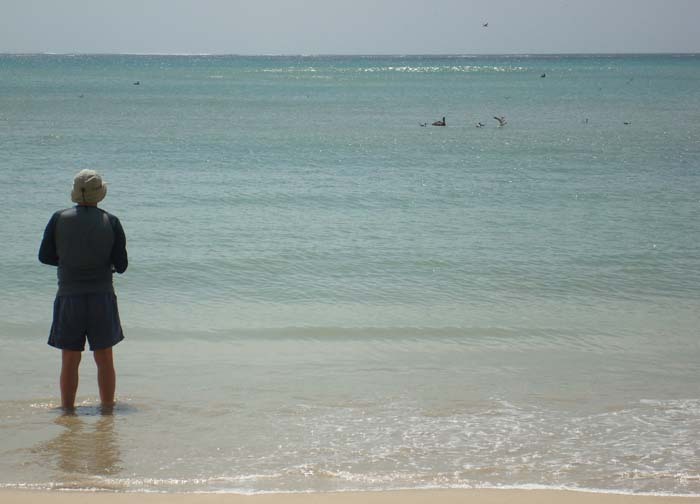 We had, at this point been joined by a local fisherman who had been walking along the beach. My audience stood fascinated as I struggled for twenty minutes to subdue the fish. The problem lay in the tackle. Everything was fine with the exception of the light wire trace which prevented me from screwing down the clutch really tight. 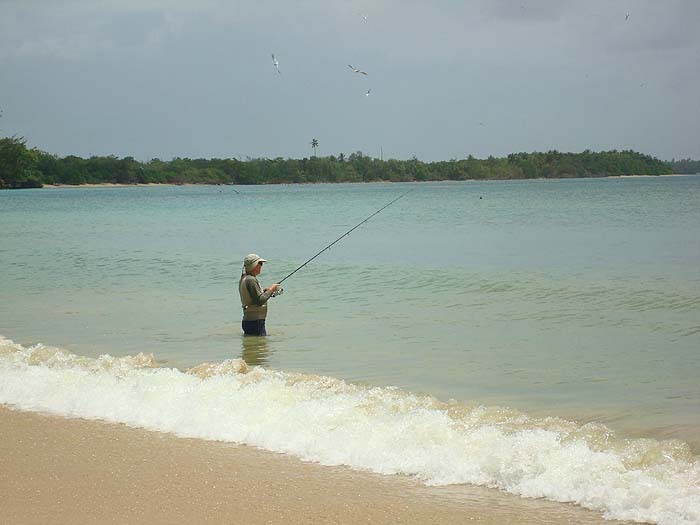 I would gain a few metres of line and the fish invariably took it back with interest, periodically throwing itself into the air and crashing back into the sea. back and forth along the beach I went with the fish gradually making it's way further out to sea. Eventually I began to see the brass of the spool under the last turns of line which told me that the tarpon was now 250 metres away. I hung on and walked backwards. I gained a few turns onto the reel then, once more, it set off out. It leapt, it swung it's great head, I had to hang on, the trace pinged and I stood there dejected. It would have made little difference because even if I'd had a stronger trace and had been able to wear down the tarpon there was no way we could have beached it without killing it and I wouldn't have done that. What an experience. Of course I beefed up the gear with a thirty pound trace and started again. In the course of the next day or two I chased after countless flocks of birds and associated blitzes. I hooked many more tarpon. One of them was roughly the same size as the monster that I lost but this time it threw the hook with a leap and a head shake. Other tarpon of perhaps fifteen kg or so were hooked fairly regularly if I could get a lure, through the squawking birds, to the blitzing fish. 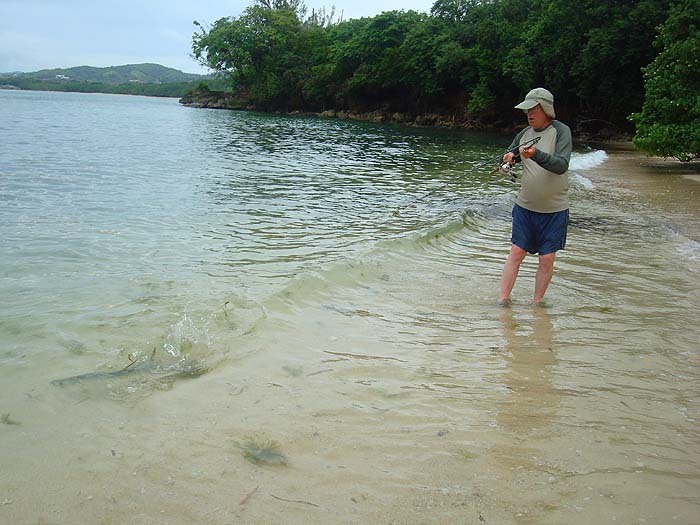 They fought in characteristic fashion, sometimes throwing the hook and sometimes staying on until I could beach them and take a picture before slipping them back into the sea. Amazing sport but the one I shall remember is the big one that got away - what a fish that was.